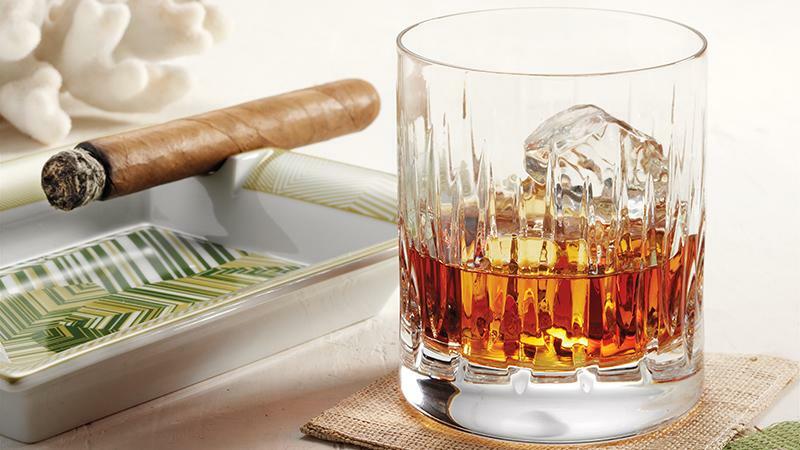 Rum is sometimes overlooked as a cigar partner, but the two are a sweet tasting natural pairing. Their ingredients—sugar cane in the case of rum, tobacco for handmade cigars—hail from similar, if not identical, regions. Forgo the clear rum you may remember from your youth and look instead to dark, aged rums, one of the fastest-growing segments in the category. More good rums are available than ever before, and some producers are even mimicking whiskey-making methods like special wood finishes. We tested some of the best rums on the market against a pair of very different cigars. The Alec Bradley Connecticut Torpedo (rated 88 points in the June 2015 Cigar Aficionado, $8.00) represented a milder smoke, with tastes of cream, tea, orange and a woody finish. The Oliva Serie V Torpedo (88 points, August 2015, $9.32) was at the full-bodied end of the spectrum, with notes of nuts, leather, maple and dried fruit. The relatively mild Alec Bradley Connecticut (top) and the bold Oliva Serie V.